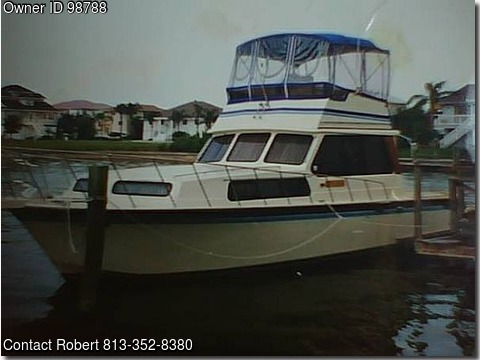 Boat is located in Tampa,Florida.Please contact the owner @ 813-352-eight three eight zero or jamescoleman634(at)gmail(dot)com..
Loa--46' twin 454 cid , 6.5 koler gen, 2 a/c units, 1 v berth, gally down, stand up shower in head area, reguler size frig, 3 burner stove, microwave, large galley sink, 20 gal.hot water heater, 10 gal.oilless air compressor for diving, 2 air hose connections plus air gauge on transom,100 gal.fresh water tanks, 2- 150 gal. fuel tanks, 16 mile jrc radar, 2 vhf ship to shore, to much more to list, call for more info, need to sell, health problems, need to move off of boat, a great live aboard, needs some tlc. 37,000 or best offer.